The spookiest thing about Halloween in this part of Manhattan isn’t the parade, which you can’t even see for the crowds, but the crowds lined up to see the parade before it starts. Spooky. Quiet. Weird. Dusk; people lined up behind barricades along the Avenue; horns honking as traffic starts to jam up – but nothing actually happening. A strange hush muffles even the honking and the murmuring. Later on things are just amusing. Here’s a Harlequin and his Skeleton Dad enjoying a Big Salty. 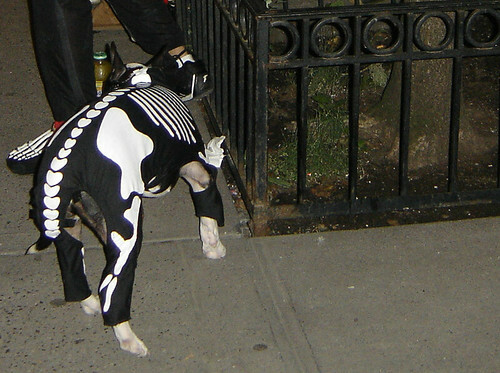 Here’s Dad’s dog, with a matching Skeleton costume. 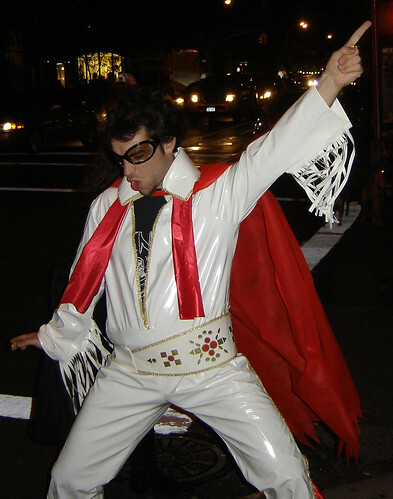 Meanwhile over on Fifth Ave., Prince Elvis Travolta struck a pose. Then I came home and we watched The Others. Now that’s Halloween-scary. When I was little, Fortunately was one of my favorite books. Tonight’s parking adventure put me in mind of it. Unfortunately, I had to give up my nice, nearby parking spot today to take my car in for its annual safety inspection, which, as a practicing procrastinator, I had put off till the end of the month. Fortunately, after I picked up the car and got home, I saw plenty of parking spaces. 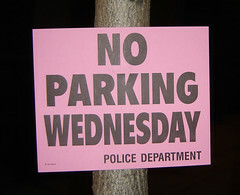 Unfortunately, tomorrow is Halloween, and some of the spots were illegal Wednesday. Something to do with the Greenwich Village Halloween parade, I expect. I wouldn’t know. Halloween is a night I stay home, sitting in the dark, quiet as a mouse’s ghost. Fortunately, further away from Sixth Avenue the Halloween preparation madness let up and there were some parking spaces. 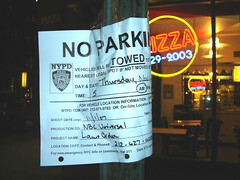 Unfortunately, the reason there were spaces was that Thursday parking was verboten because of a Law and Order shoot. Fortunately, this Thursday is something called “All Saints Day,” which must be something like Veterans’ Day but for saints, but which, for my purposes, means alternate side parking regulations will be suspended, which means that if I can find another Friday-OK spot, it’ll be Thursday-OK too, which means I won’t have to move the car again all week. Unfortunately, I couldn’t find a spot on the proper side because of Law and Order (see Unfortunately above). Fortunately, Law and Order only needs two streets, not the entire neighborhood. I found a Thursday-OK spot a few blocks further away than usual. Unfortunately, all of this made me miss the wine tasting at Union Square Wines. From a Beatles tribute by a venerable classic rock band, to a DIY New York City crooner, to a singular bluegrass-jazz fusion project from up Colorado way, there's probably something for nearly everybody in this week's round-up. Read, click, and enjoy! This appropriately titled CD comes as a nice surprise to the unprepared listener. A truly unique fusion of bluegrass and old-time jazz, it's a showcase for banjo picker extraordinaire Pete Wernick, vibraphonist Greg Harris, and clarinetist Bill Pontarelli. They're supported on a well-chosen set of standards and originals by an able rhythm section, with Joan Wernick adding uninflected but curiously charming vocals. The head picker in charge wails on his instrumental composition "Traveling Home," then steps aside for tasteful solos by Harris and Pontarelli. A celestial vibes introduction leads into a fun version of the old fiddle tune "Blackberry Blossom." A few other highlights: the fast-steppin' "Leavin' Town" (written by Pete Wernick), the softly insistent "Snowbird," and, on a mellower tip, "Wrap Your Troubles in Dreams." Forgive the obscure reference, but in spirit this reminded me of Pierre Gossez's alloy of Bach and jazz. And genre-mixing aside, the CD is suffused with such good feeling that it's hard to imagine it failing to cheer you up when you're blue. The veteran band Firefall's acoustic Beatles covers are reverential, but distinctive enough to provide an original and happy listening experience. The duo of Steven Weinmeister and Firefall founding member Jock Bartley have chosen a varied set of Beatles songs that thrive under their stripped-down but polished, 70s-soul acoustic sound. It has to be said, of course: songs like "Within You Without You," "Girl," "Norwegian Wood," "Here Comes the Sun," "Eleanor Rigby," "Come Together," and "I'll Be Back" have long since proven their timeless brilliance, and you'd have to work pretty hard to screw them up. Early Beatles, late Beatles, Lennon & McCartney or Harrison, it doesn't matter, these consummate musicians do right by 'em. On the last two thirds of the album the songwriting starts to get a bit pedestrian. The snaky groove of "Devil's Best Friend" and the plaintively dark acoustic ballad "Your Silence" are something of a return to form. So, while this isn't a great album through and through, the band's best work is excellent and it's no surprise these New York indie rockers are getting themselves some TV licensing spots and prestigious gigs. Check them out at their website or Myspace page. For a slice of low-key, jumpy urban angst, James Vidos is your man. The first two songs, "One I Wanted" and "Draw Me a Picnic," are the best; in "Let's Promenade," Weill-like oompah verses alternate with soft, flowery choruses, with Vidos's airy, languid baritone nicely drawing out the vivid, vaguely apocalyptic imagery. Think Nick Cave. The tunesmithing doesn't always measure up to the meticulously developed atmosphere. As a whole, the material would benefit from stronger vocals too. But for stumbling through the streets of the Lower East Side in the wee hours of a rainy night, this will be a fine accompaniment. Feeling extremely white, and slightly weird? Open up your heart to Suzy Callahan's happy melodies and up-front, pretty voice, which mask an ever so slightly twisted sensibility. From the title track: "I watch you but who's watching me? / Not the beetle or the bee / They're all going to the freedom party without me." You never find out what the freedom party is, or represents – you just have to draw your own conclusions. Callahan sings plainly of simple emotions but has intriguing ways of framing them. The narrator of "Southern Belle" changes from a strong, modern woman into a weak-willed, helpless female when she encounters an attractive "wild man." It's a story that any number of women might tell, but Callahan's image of the strong woman isn't defiant, triumphant, or entirely satisfied. Rather, "I was down in a trench for days / Air nor light could penetrate / Digging alone, bone on bone… Thinking of home, but not my own." She's drawn comparisons to Neko Case and Lucinda Williams but in some of her drama I was even reminded of Katell Keineg – e.g. in the chorus of "We Had a History" – or Liz Phair in the disturbingly baby-like simplicity of "I Smile". Sasha Sacket fortifies his earnest, adult alternative music with bursts of power-pop energy and dense electronic orchestration. The rich buttery sound is appropriate since most of the songs on his new CD are avowedly about love, and it has the distinct flavor of a concept album. So, although the songs work individually, the CD is best experienced as a whole, which is saying a lot, because many of the songs are quite strong in and of themselves, despite a tendency toward scattershot lyrics. The success of this music is not about the sense of the songs, so much as the feeling stirred up by Sacket's keening vocals, which suggest Thom Yorke, and his haunting melodies and piano-heavy arrangements, which sometimes resemble Sarah McLachlan, or Neil Finn's most contemplative solo work. Listen at the artist's website. No, not really. It just always seems to rain when I’m driving to a gig in Connecticut. Supposed to rain tonight, naturally. 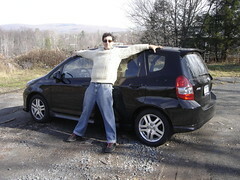 But my adorable Honda Fit will surely be up to the job. It has proven to be an awesome city car, fitting into parking spaces most mortals can’t attempt, but still with plenty of room in the back for mortal dross. Last night’s Whisperado gig at The Underscore went pretty well. The booker tries to put compatible bands together but it rarely works out – not his fault, there are just too many bands and too much flakiness in the world. So we had a fun time watching Dead Eyes of Fall who went on after us. Talk about hair – these guys really went to rock star school. They’ve got a smokin’ double-pedal drummer and shredding lead guitarist too. I wore earplugs. And remember, Whisperado loves you all. ‘Tis the season for sprawling three-disc surveys of American music. Hot on the heels of Murder Ballads & Disaster Songs 1913-1938 comes my copy of Janet Reno’s Song of America. The former Attorney General, with her nephew-in-law, Nashville pro Ed Pettersen, and two other co-producers, has put together a 50-track survey of American history in song as interpreted by an assortment of talented artists of various levels of renown. Disc 1 (1492-1860) has the largest amount of inspiring stuff. Three a capella numbers – “Lakota Dream Song” sung by Earl Bullhead, the Blind Boys of Alabama’s gorgeously harmonized slave-era spiritual “Let Us Break Bread Together,” and the the Fisk Jubilee Singers’ steely version of “Go Down Moses” – are soul-stirring, and John Wesley Harding’s harshly off-kilter brass band arrangement of “God Save the King” vividly evokes the war pains of revolutionary times. But more often, modern stylistic choices undercut the songs’ power. Often these choices reflect the 20th century fashion for confession in art, where smallness, quirkiness, and meekness are the rule. Elizabeth Foster sings a haunting arrangement of “Young Ladies In Town” (or “Address to the Ladies”) in a chillingly beautiful, quavery voice, but she swallows so many of the lyrics that the meaning is lost. (Some of them can be found here.) A vivid splash of history, the song was a pre-Revolutionary call for women to wear only homespun clothing and not British imports. Malcolm Holcombe lends gravitas (and gravel) to “The Old Woman Taught Wisdom,” a plea for reconciliation between Britain and the Colonies, while Harper Simon, who sounds like a more psychedelic version of his father Paul, was an inspired choice to arrange and sing “Yankee Doodle.” But producer Ed Pettersen’s soporific take on “The Liberty Song,” Steven Kowalczyk-Santoro’s goopy “Hail Columbia,” and Beth Nielsen Chapman’s languid, affectless version of “Sometimes I Feel Like A Motherless Child” are more typical of the collection’s overall low energy. (“Jefferson and Liberty” is done as a lively bluegrass tune by The Wilders – but what’s the point without the words?) Backed by The Mavericks, Thad Cockrell sings the usually march-like “Dixie’s Land” as a slow swell, but in that case, the re-imagining of a traditional song works. Marah’s rough-and-ready “John Brown’s Body” is a welcome blast of energy to start Disc 2, which covers 1861-1945. Jake Shimabukuro wails the “Stars and Stripes Forever” on his ukelele. The Black Crowes and their father Stan (billed as the Folk Family Robinson) deliver an honest and moving reading of Woody Guthrie’s “Reuben James,” one of the great topical songs of the 20th century. Old Crow Medicine Show, my favorite of the new crop of Americana bands, does a nice job with Woody Guthrie’s plangent lyric about illegal migrant workers, “Deportee (Plain Wreck at Los Gatos).” And Janis Ian sings the grim “Johnny I Hardly Knew Ye” – perhaps the saddest song ever written in the English language, at least prior to the oeuvre of Harry Chapin – a capella and with all due reverence. The song benefits from the quiet treatment. So does “Over There,” chirped with effective hollowness by – speaking of the Chapin family – Jen Chapin, over Stephan Crump’s mournful sawing on the bass. Instead of a rousing call to arms the song becomes a thoughtful consideration of the business of war. The early Jazz Age is represented by Andy Bey’s smooth, moody version of “Brother Can You Spare a Dime” and a jaunty “Rosie the Riveter” from Suzy Bogguss, who isn’t a jazz singer but does a decent job. Classical soprano Karen Parks contributes a lovely, art-song version of “Lift Every Voice and Sing,” and Danielson‘s “Happy Days Are Here Again” is refreshingly nutty. But for every well-done or interesting track, there’s a colorless, tepid one. These sleepy versions of what have always been significant, meaningful songs are disappointing. Disc 3, 1946-present, is also a frustrating mix of the fresh and the tired. It’s great to have Elizabeth Cook and The Grascals’ new recording of the Louvin Brothers’ “Great Atomic Power,” and having Devendra Banhart take a crack at the 1960s condemnation of suburbia, “Little Boxes,” was an inspired idea. But the recasts of very familiar rock-era songs like “The Times They Are A Changin’,” “What’s Going On,” I Am Woman,” and “Say It Loud, I’m Black And I’m Proud” don’t add anything much, though they’re mostly nice enough. Kim Richey having a calmly joyous time with the 60s anthem “Get Together” is something of an exception, and the Ben Taylor Band’s sleepy take on Neil Young’s great protest song “Ohio” is curiously affecting. Bettye LaVette comes off well, taking Bruce Springsteen’s “Streets of Philadelphia” to soulful heights the Boss’s own inexplicably Oscar-winning version didn’t even approach. But Scott Kempner, Martha Wainwright, Gary Heffern, The Wrights, Matthew Ryan, even John Mellencamp, seem just plain sleepy. Maybe the songs are still too iconic, or too current, for newer artists to want to update them in any interesting way. Pettersen and co. should take a listen to Neil Young and Crazy Horse’s “Blowin’ In The Wind” (on the live Weld album) to hear an example of how a classic can be rebuilt with enough originality and power to draw even deeper waters from an already deep well. In any case, the result here is a set that seems too much like a dry history lesson, rather than the exciting rainbow of historically meaningful songs it could have been. Education is actually one of the main purposes of the compilation, and Discs 1 and 2, at least, will be good teaching tools. But less postmodern, shoegazing gloom and more rock and roll spirit would have given the whole collection more color, both as a musical tapestry and as a way of interesting kids in American history from the standpoint of those who struggled and still struggle. And speaking of struggles: Native American and African American songs and interests are pretty well represented, but the lack of any Hispanic material is a serious omission. Serious…that’s the right word. Too much of these tracks just feel too darned hands-off and serious. Leslie Caveny’s experience writing for television is evident in her sparkling new comedy, Love of a Pig. Like a well-written sitcom episode, it boasts fast pacing, short, sharp exchanges, minimal time between laughs, and one dramatic decrescendo into touching quietude. What makes it special is that it extends the best features of scripted TV comedy over an hour-plus of live action, without losing focus or shine. Also like a sitcom plot, the play is built upon a hackneyed premise. The aptly, drably named Jenny Brown (Dana Brooke), a twenty-something violin grad student, can’t get a date. There’s nothing wrong with her appearance or personality; rather, she’s locked in a cycle of low self-esteem and high self-consciousness that makes her an Invisible Girl when it comes to attracting Joe (Steven Strobel), a brooding, self-absorbed bassist, while blinding her to signals from a guy who does find her appealing. Pretty common stuff. But Caveny, director D. H. Johnson, and the sprightly, almost scarily talented cast spin it into a perfect piece of salty-sweet fun. The play is simultaneously an ensemble piece and a star turn for Dana Brooke, whose tour de force of a performance is a controlled explosion of emotional movements and colors. The other seven actors play a variety of roles, some more or less realistic, some clownish and even puppetlike – from barfly to mailman to fellow students to door (yes, door). David Nelson is delightfully squirmy as the bitter, over-sensitive music instructor, and Jenny Greer is hilarious as our heroine’s lightheaded teenage sister, but there are no weak links in the cast or the production as a whole. Credit must go to the director for keeping the proceedings so peppery and brisk. Yet despite all the vigorous action, cute business, and a facile ending, there’s enough substance that you feel you’ve been in the company of real people with realistic problems, behaving just as kindly and cluelessly as your own friends and acquaintances. Except these folks are funnier. Much, much funnier. Wednesdays through Sundays through Oct. 28 at the 45th Street Theatre. Tickets online or call (212) 868-4444. Here’s the trouble, see. Last night I’m getting ready to submit a review of Tompkins Square Records‘ new compilation of old murder ballads and disaster songs. I’m emailing with the record label guy about it and he tells me they’re having a CD release party later that night at Cake Shop and do I want to come? If I lived in Lansing, MI or Natural Bridge, VA this sort of thing wouldn’t happen. I’d post my review and then sit at home by the fire reading a book or something, probably petting a cat and listening to the crickets out my window or the distant crack of the polar ice melting into the ocean. But because I live in New York everything seems to be happening right here and it’s so hard not to go out. Can’t miss anything! Maybe there’ll be well-connected people to network with! Maybe something awesome will happen! Maybe I’ll meet a celebrity! Or get a free drink! Gotta go! Gotta run downtown! It’s even worse now that I’ve moved from Brooklyn to Manhattan. In spite of the great Brooklyn cultural renaissance of the past decade, Manhattan still has a greater concentration of stuff to do – if only because of sheer geography. So I go down to Cake Shop and I meet the head of the label and the producers and I hear and meet some fantastic musicians. Singer and banjo picker Hank Sapoznik, who co-produced the album, got a pick-up group together, including the wonderful fiddler Michelle Yu of The Moonshiners, to play a set of jumpin’ old-timey music. Following them, Greg Jamie of O Death came on to perform some of the numbers from the album. Chris King, the other producer, had seemed disappointed when I told him the songs on the compilation hadn’t “disturbed” me, but Jamie’s band was certainly one of the oddest and most disturbing groups I’ve seen. So there you go, Chris – I was disturbed in the end, after all. By live music. Which is as it should be. Of course, James Blunt disturbs me too. But that’s different. That’s not in a good way. There are some things you won’t get to see in New York, of course. Foamhenge, for example. So it’s important to get out of town once in a while. Disc 1, “Man V Machine,” includes many songs about railroad disasters, from famous stories like the Old 97 and Casey Jones to obscurities like Ernest Stoneman’s tale of a fellow named Talmadge Osborne who died trying to get on a moving freighter, and Alfred Reed’s “Fate of Chris Lively and Wife,” whose wagon got hit by a train. There are auto, airship, and airplane crashes, and a weird reworking of the John Henry legend called “Bill Wilson” by the Birmingham Jug Band. The Titanic is well represented, most curiously in a recording of a traditional Hebrew prayer recorded in 1913 by Cantor Joseph Rosenblatt, and a stream-of-consciousness spoken word ramble by Frank Hutchison written fifteen years after the great ship went down. Disc 2, “Man V Nature,” deals with “natural” events like fires, floods, drought, pestilence, and disease. (Times haven’t changed all that much since Old Testament days, have they?) The great Mississippi flood of 1927 weighs heavily in this group; rock fans will recognize the basis for Led Zeppelin’s classic “When the Levee Breaks,” recorded here in 1929 by Kansas Joe and the great guitarist Memphis Minnie. But there was a great variety of disasters to sing about. Charlie Patton’s compelling first recording, “Boll Weevil Blues,” is here, contrasting interestingly with Fiddlin’ John Carson’s take on the same subject. Charlotte and Bob Miller’s rendition of “Ohio Prison Fire,” written just three days after the dreadful 1930 blaze that killed more than 300 prisoners, includes an extended spoken dialogue between a grieving mother and the warden, while Blind Alfred Reed’s “Explosion in the Fairmount Mine” uses an unusual minor chord to dramatize a child’s premonition of that 1907 disaster. The songs on Disc 3, “Man V Man (And Woman, Too),” recount violent deaths at the hands of cops, angry lovers, crazed fathers, outlaws, lynch mobs, and the State. Most were real events of the 19th and early 20th centuries, but the stories are exactly like those of today. Plus ça change is the clearest message these musical tales send to us in the 21st. The handsome packaging and liner notes include background on the songs, the recordings, and the artists, many period photos, and selections from the lyrics. Famous disasters and familiar characters like Tom Dooley, Stack O’Lee, Bruno Hauptmann, Casey Jones, and even Pretty Polly mingle with obscure local tales and the nameless (but, through these songs, not forgotten) dead of disasters past. The music isn’t consistently great, and some of it is readily available elsewhere, but it’s all interesting; taken together, it’s a fascinating treasure trove of doom, and an enjoyable lesson in how American history played an intimate part in defining the popular music of the period – music that gave birth to the forms and songs we listen to today. The prolific Bekah Brunstetter has written another fine play, and this time I can say that without any caveats. I Used to Write on Walls is funny, deep, innovative, and affecting on several levels. Brunstetter’s central skill of creating painfully real female characters is truly put to the test in this play, where there are seven of them and no ensemble scenes. She not only meets but surpasses her own test. A lonely, fat policewoman, a suicidally insecure makeup artist, and a beautiful spoken-word performer all fall for a California surfer dude (Jeff Berg) who’s in New York City on a “rad, rad philosophical journey” to right humanity’s wrongs. Immature, untrustworthy, and stupid, the ridiculous Trevor is plainly nobody’s Mr. Right. Yet with an easy charm, good looks, and a few sweet words, he divests the women of their judgment as easily as he gets them out of their clothes. Even Georgia (Levita Shaurice), the sharp, self-aware poet, can’t help wanting more from Trevor than he is obviously prepared to give. So maybe it’s not such a surprise that the overweight, 34-year-old Diane (Maggie Hamilton, with exquisite comic timing) falls for his sweet-talk. Or that self-hating Joanne (Darcie Champagne), whose debilitating anxiety visibly quivers just under her bubbly surface, clings, literally for dear life, to his childish optimism. But when he meets his match, in the person of the overripe, nutty, and possibly dangerous Mona (Ellen David), the blubbering little boy within is revealed. On stage a great deal of the time, Berg makes Trevor an entertaining and, against all odds, very human villain. The real enemy, Brunstetter is telling us, is the pressure women put on themselves to be and look perfect, and the too-often impossible dream of matching what you want with what you have. Yet the playwright doesn’t heavy-handedly blame “society” or “male-dominated culture” for her women’s plight. Each in her own way, the women reveal their weaknesses; they are fully realized people at the mercy of a complexity of forces, some programmed right into their own natures. Rachel Dorfman and Mary Round are very good in mother roles, and Chelsey Shannon persuades as eleven-year-old Anna, who represents, in a magical-realist sort of way, how women – at least in Brunstetter’s convincing vision – start out life: on one level, pure and innocent, but already bearing the ova of corrupton and disappointment. From Anna’s mother’s heartbreakingly funny toss-off line – “Don’t look directly at me, it burns” – through Diane’s sad and hilarious voicemail confession, the Fellini-esque tableau at the end of Act I, Trevor’s breakdown, and Georgia’s genuinely poetic, Chorus-like coda, I Used to Write on Walls is the work of a playwright coming into full mastery. Thursdays through Saturdays through Oct. 27 at the Gene Frankel Theatre Underground, 24 Bond St. between Lafayette and Bowery, NYC. Tickets online or call 212-868-4444. Mature language and themes. Big pile o’ CDs. Can’t see over it. Good part: nobody can tell I’m here. Anyway this week a bunch of quickie reviews. Using sentence fragments. Dive in! Solid, well-written new Jersey rock with a late 70s/early 80s sensibility and a vocalist, Dylan St. Clark, whose upper register sounds like Huey Lewis. Hard-rocking guitar licks and sprawl. Rocker tunes characterized by a certain melodic monotony, St. Clark using only one mode: shout-it-out passion at the top of his lungs. Fortunately also a variety of gentler songs where he shows range, plus “Save Me.” Suspect these guys are very good live. Hear extended clips here. Zinger choruses rubbed in moody, mod grit. Quietly bracing, especially to listen in the morning, like a splash of bay rum on the hot old face. Song titles like “From Music to Nothing,” “Lest I Find Some Dissonance,” and “Pigeons” sum it up. Italian yet somehow New York. Nick Drake fans will probably like too. Listen and buy. Raw crunchy album rock inspired by psychedelia and Stones, classic Strat sound. Voice a high keen like a subset of Jimmy Page’s, sometimes early Mellencamp, or a Black Crowes or ZZ Top howl: can get a bit tedious, but powerful in best rockers like “Here We Go Again,” “Love Is All Over Me,” “Come To Life.” Not so much in some of ballads. But still like them. Unexpectedly soulful but grokkable lyrics. A very assured debut; a keeper. Listen and buy. Soothing jazzy pop. Is much soothing jazzy pop in world. Here more. Much keyboard. Also some well played guitar work and well planned strings. Also a touch of folk-rock sheen in the writing and eerie throbbing ecto-electronica. Bored me in the late afternoon. Listened again next morning, found it quite… soothing. Voice like velour. Chord changes like a lava lamp. A subtle record. A mood record, a time of day record. Be soothed. Gotta be honest with you – I popped this in only because of the cool cover design. Seven-song EP inside not too bad either. Emotional-mechanical. Stuffy-nosed singer sounds like Ric Ocasek (but sometimes overdoes I-don’t-care’-how-yucky-I-sound attitude). First two songs are best, “Sleeping Machines” also good. “Juliana” an effective punky ballad. Still – synth-rock style calls for raising of overall songwriting level. Can these guys do it? Jarez toured with his cousin, the rapper Coolio, so he knows some stuff, I guess. But his smooth jazz is worlds better than his ashen r&b. Warm, sensitive, jazzy chamber pop with pleasing harmonic motion. “Surrender” has Bacharach flavor while “Stand By” evokes more jazzy Tori Amos. I dig “Find Some Time” and “Who Will I Be” and the lush ballad “Lay My Head Down” and others. Hear and buy at her website. All done. See you next week, when we return with our regularly scheduled program of complete sentences. H. G. Brown’s new heist tale centers on Eddie Hajazi, a charmer with a cruel streak who needs a crew to help him pull off a big maritime heist. Played with sleazy suavity by Robert Funaro (known to many as Eugene Pontecorvo on The Sopranos), Eddie artfully appeals to the needs and the dreams of three local men. Mal (Robert Sheridan) is a former contraband runner gone straight, now trying to make a settled life for himself and his new wife, Bev (Vivienne Leheny), as a modest innkeeper. George (Gordon Silva) tends bar at Mal’s place, and Harley (Jack Rodgerson) is a piano-playing dockworker down on his luck. Three women complicate the scheme: the hardworking, morally centered Bev; Harley’s girl Alice (Kelli K. Barnett), an oversexed stripper with a heart of gold; and most of all, Bev’s friend Joyce (Kate Udall), a sultry newspaper writer. Even these colorful characters are almost upstaged, early on, by Joseph Spirito’s spectacular set. Though Mal and Bev are slowly renovating the inn, the barroom where the action takes place is a character of its own. The stained wood sings with color and history, while the wall decor and the jukebox (stocked only with oldies) define a worn and comfortable sailors’ haven. Luckily, Brown’s snappy dialogue and director Stephen Sunderlin’s brisk staging keep us focused on the action. Act I’s character introductions and set-up scenes boast a sprightly, slightly elevated dialogue that’s reminiscent of Lanford Wilson’s (think Hot L Baltimore), but delivered by the cast in a way that sometimes crosses the line from animated into hammy. It feels to me as if director and cast are a bit hamstrung (no pun intended) by an inconsistency of tone. The script is part gangsters-and-molls (think Key Largo) and part late 20th century TV comedy-drama. One wishes it would go all the way in one direction or the other. This flaw prevents the play rising above clever entertainment to become higher art. Joyce, the writer, is the epitome of this conflict. Though Udall fleshes her out with a rich and funny performance, she’s an anachronism in a story that’s meant to take place in 1984. Some of her speeches feel like a nostalgic 1940s High Hollywood take on journalistic intrepidity. On the other hand, Udall and Barnett play out their scenes of drunken female bonding with vigorous humor, and both their characters attain a level of depth that’s a credit to their performances, the playwright’s skill with characterization, and the director’s vision. I also found Eddie’s roguish appeal to the women difficult to credit. As played by Funari, his charm is so patently artificial that one would expect even a hard case like Alice to see right through it. The philosophical Mal and even the bitter Harley have no trouble discerning Eddie’s rascality, only casting their lot with him out of acknowledged greedy or desperate motivations. And Bev, the moral center of the play, wants no part of his scheming. The show is quite entertaining despite those flaws. Its length and pacing are exactly right, and it has some wrenching moments – especially in the women’s scenes – where the raw underside of humanity is exposed to the wind and the sea spray that you can almost feel through the windows of the weathered barroom of the Carney Hook Marina Motel. Mofro, one of the best American bands of the new century, has grown a bit in size, adding a three-man horn section, and (probably of necessity) gotten a bit more polished since I saw them last summer. The need to direct more musicians makes lead singer/guitarist/keyboardist JJ Grey less like a shaman and more like a gospel/soul bandleader. If anything, though, his onstage self-confidence – to use a technical term, his mojo – has strengthened. Drummer George Sluppick, functioning as second-line band leader, has added some sting to his beat while retaining the heavy foot. Absurdly nonchalant guitarist Daryl Hance and casually funky organ/keyboard-bassist Adam Scone round out the core of the band. Mofro, especially with the horns, is a loud band. But the near-perfect acoustics of the new Highline Ballroom (in the Meatpacking District, upstairs from Western Beef) made everything clear as a bell. Every word of the lyrics could be heard and understood; every wrinkly, scratchy note from Grey's Wurlitzer came through clearly. Highlights of the set included "Tragic," "By My Side," "Circles," and "Country Ghetto," all from the new CD, as was the slow, gospel-influenced encore, "The Sun is Shining Down." "Six Ways from Sunday" (from Lochloosa) turned into an extended jam, and "Florida" (from Blackwater) got the crowd into a frenzy which continued through a mopping-up (nameless?) jam that closed the official set. Assembly of Dust (see my CD review in this column) is the exact opposite sort of band. Where Grey directs his group from a position of charisma and total dominance, AOD's Reid Genauer leads by getting out of the way. Not blessed with an especially soulful voice or a magnetic onstage personality, Genauer has the gift of generating small sparks that his band can blow into roaring fires. If a Mofro set feels rooted in the 60s, AOD recalls the 70s, referencing the Allman Brothers, Boz Scaggs, Steely Dan, and Bakersfield country. Lead guitarist Adam Terrell looks like a college professor but blazes during his long, astoundingly fluid solos, which owe much more to Duane Allman than to Jerry Garcia. Keyboardist and co-writer Nate Wilson plays with easy flair, while bassist John Leccese and drummer Andy Herrick lock in as well as any rhythm section I've heard. The first few songs seemed small and overly controlled. Genauer's wispy presence requires you to "lean in" to get what the band is doing. But after a few songs things started to deepen, the excellence of the band became apparent, the dynamics kicked in, and much jamming ensued. More than I could take, actually; I missed the end of the set because of the problem with Highline Ballroom and similar venues: they're standing-room-only rooms, with just a few tables on the sides. There's a reason I'm not a butler. Three and a half hours is as much as I can take standing on my feet. Still I came away with much appreciation of Assembly of Dust, and another memorable experience of JJ Grey and Mofro. 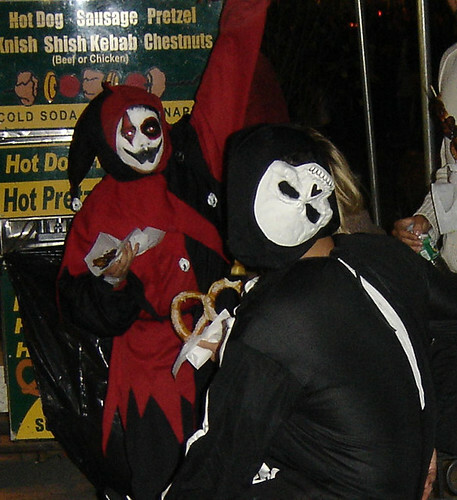 You are currently browsing the The Bagel And The Rat blog archives for October, 2007.